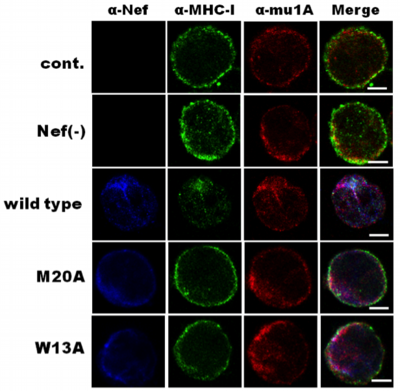 Two amino acids at the N terminus of Nef contribute to binding with mu-1A. Cells were stained with Nef, MHC-I, and mu-1A antibodies and analyzed by confocal microscopy. Blue, Nef; green, MHC-I; red, mu-1A. Bars, 10 μm.